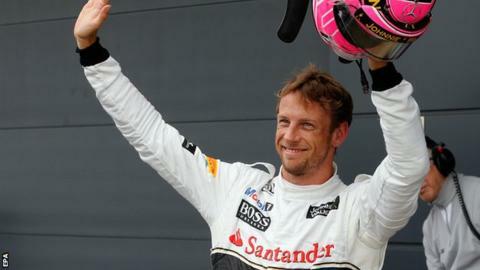 Jenson Button is considering a switch to the world endurance championship should he fail to land a competitive Formula 1 seat for next season. McLaren are waiting for an answer from their main target, Fernando Alonso, before finalising their driver line-up. Button is only interested in remaining in F1 if he can secure a competitive car, his manager Richard Goddard said. McLaren are the only big team still to finalise their line-up. They have not decided whether to retain Button or his team-mate Kevin Magnussen alongside Alonso if the Spaniard decides to join McLaren rather than take a year out of F1 in the hope of securing a Mercedes drive in 2016. Goddard said: "McLaren aren't sure what they're doing and what their line-up will be. That's pretty obvious. "Anyone who has a race seat available would like to have Jenson in it. "Jenson is still focused on F1 but would only want to be in one of the top teams. So we're always open to talking to anyone." Goddard described the world endurance championship as a "formidable series that is gaining strength". He added: "It is a very credible race series to compete in. "Jenson is an incredibly competitive racing driver who wants to race. He's too good to sit at the back of the F1 grid. So he either gets a competitive car in F1 or he goes to get one elsewhere." Button has scored nearly double Magnussen's points this year. The Dane's qualifying pace has impressed - he leads Button by nine to seven in his rookie season - but his weaker performance in races is a concern for the team. It is conceivable that Button, the 2009 world champion, may end up taking the matter out of McLaren's hands. Button could find himself in a position where he has a strong offer on the table from Porsche or another team and has to demand an answer from McLaren. If McLaren are at that point unable to guarantee him a drive in F1, Button may decide that a switch to the world endurance championship is too good an opportunity to miss. Alonso is leaving Ferrari two years before the end of his contract, having secured a release from the team at his request. Ferrari have not yet officially confirmed the 33-year-old's departure, or their signing of Sebastian Vettel from Red Bull to replace him. But their former president, Luca Di Montezemolo confirmed on Italian television this week that Alonso was to leave the team. Vettel will partner Kimi Raikkonen, who still has at least a year on his Ferrari contract to run, while Red Bull have promoted Daniil Kvyat from junior team Toro Rosso. Alonso's preferred option is to join Mercedes, but Lewis Hamilton and Nico Rosberg are both under contract to the new world champions in 2015. Hamilton's contract is up for renewal at the end of next season, but Mercedes have made clear their desire to secure a new deal with him. Mercedes F1 boss Toto Wolff has said they will not sit down and talk about a new contract with Hamilton until after the end of the season, once the drivers' title battle is settled. Alonso is hoping those talks hit trouble, but sources say the likelihood of him joining McLaren appears to have increased in recent days.